We received a request for some RV camping tips from a friend of ours, and decided to include the information here for the benefit of anyone looking to avoid some camping pitfalls with their RV. We encourage you to drop us a line if you have a good tip so we can include it. Use Checklists!!!!!!! No matter how many times you move your RV, you can forget to do something! Roof vents and TV antennas are the biggest offenders for most folks, but basement storage bins being left unlocked can make you lose some good stuff! 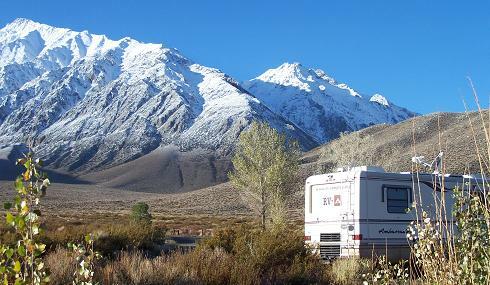 Learn about the many places you can go RV camping. Private RV parks are popular and easy to find, but there are many RV camping locations off the beaten path. Public lands are available in every state for camping, and a quick way to find your states public land management resources is by using the RV Camping Map. Check tire pressure before every trip!!!!!!! I do, and still had a double dual blowout on I-10 last December. I figure that I caught a nail or something that caused one tire to go low pressure, and all that it took was time to heat up the other tire and take them both out! Speaking of on the road problems…if you can’t change your own tires like we can’t, or you do break down, roadside assistance is worth every penny! Our double blowout cost us $385. That was the cost of 2 tires and tax. Service call, labor, mounting and balance was covered by the road service. We also picked up a nail in a front tire and just needed the spare put on…No additional charge! Staying in RV parks alot??? There are several discount camping clubs that might work for you and where you need to travel. Check them out carefully as no club is right for everyone. We don’t stay in RV parks more than a night or two a month, so we don’t belong to a discount program. Our Discount Camping Section has a list of several discount camping clubs. Weigh your rig!!! It is SOOOOOOO easy to overload an RV!!!!! You really need to weigh each corner of a motorhome separately so you can balance your load, and hitch weight ratios on trailers must be adheared to. Your life depends on it! Measure the height!!!!! Don’t guess!!! You WILL get into situations where a building canopy is too low for you to fit…also remember when parking at a curb that the top of the vehicle may be hanging over the curb due to slope of the street…this can be very embarrassing if you tag a light pole or tree too close to the street. Get a pair of small hand-held Family Radio Service(FRS) radios to communicate with each other during parking/backing of the RV, or get on the same page with hand signals. I suggest the FRS radio method as most reliable…and if you get separated in Walmart they work too! When staying in RV parks or campgrounds with hookups, don’t leave the black tank “open”. Only dump black when tank is 2/3 full or more otherwise you stand a good chance of having a clog. The same is true to some extent with the gray tank. Dump black first every time so the gray water can help clean out the dump hose. Are you towing a vehicle? If you tow with all 4 wheels down, you will not be able to back up more than a few feet at most!!!!! This is always a problem at the worst possible place. For example, I dumped our motor home at Colorado’s Chatfield Reservoir a couple years ago with the Jeep hooked up and couldn’t make the U-turn I thought I could, and had to disconnect the Jeep before I could back up to complete the turn. I was lucky that there was only one person waiting to go by me as I unhooked the Jeep, then got the motor home out of the street. This can happen even easier at fuel stations. Don’t forget that some vehicles can’t be towed 4 down!!! When you pull into an RV park and go to hook up water, I suggest turning on the water for a second or two before hooking up your hose. I would have had quite a bit of rust in my tank if I hadn’t followed this advice. In addition I’d suggest a water sediment filter that goes between the water spigot and the motor home to help keep junk out of your tank. When we camp in the desert Southwest, often the water taste is poor. We’ve found that the Pur brand of charcoal water filtration system available just about everywhere like Walgreens, Walmart, Kmart etc works great to take the smell and bad taste from the water. Back to RV parks for a second…Power can vary widely from park to park. At the very least get a good surge protector for the RV, and there are several rather expensive power conditioners available that will protect against surges, and improve commercial power. Satellite TV… Our power inverter makes what is called “modified sine wave” AC power. This power works great for micro wave, TV, computer and everything else EXCEPT the satellite TV receiver. We now have a pure sine wave inverter (just a small unit of 150 watts) that turns 12 volts DC into clean AC that works for the satellite TV receiver. (We understand that new receivers will work on modified sine wave…check specifications carefully) Note – The digital TV conversion boxes that can be used on RVs as well as homes may require a sine wave inverter. Will you be boondocking (remote dispersed camping)? This is our standard mode of traveling whenever possible, and throughout the west, there is plenty of public land available for it. The issues here are how to conserve resources so you can stay out longer without having to find an RV dump and fill location. We carry a couple extra 7 gallon water containers and have a 12 volt electric pump to transfer the water from the containers to RV fresh tank. We can stay out with our rig for 14 days if we are VERY careful with water consumption. Here is a link to information about finding good spots to camp…Boondocking. You can save water by washing dishes in a dish pan instead of the sink. Wipe plates off first before washing to cut down on water needed. Take Navy showers…get wet, shut off water, wash yourself, rinse. Experiment with soaps and shampoos to find what you like AND rinses easily. You can save gray water space by washing your hands outside…use a plastic milk jug for water and poke a small hole in it and put a golf tee in. This will keep the water in the jug, pull the “tee” when you want water and it dribbles out instead of running down the sink! Use Scott single ply toilet tissue. We don’t buy the expensive RV toilet paper…we think it’s the same stuff at a fraction of the price. You will find a lot of people use RV holding tank chemicals, but we don’t recommend them. The black tank smell comes from bacteria, but by not using chemicals, you promote another type of bacteria that eats the waste and kills the smell. Smells coming from the tank inside are a result of a plugged or disconnected vent pipe to the roof. Don’t use antibacterial soaps unless you really want to…this will kill the good bacteria that eliminates the bad smells in the gray tank too. RV awnings are great…as long as they work and don’t get ripped off in a freak wind. My example is our trip from Washington State to Denver last December. We hit very heavy side wind which just happened to catch the big awning turning it into a parachute. If I had straps (bungi cords) around the awning supports and roller, I wouldn’t have needed a new awning. Check for leaks, and if you find one, don’t wait…fix it now!!!!! Water is an RV’s worst enemy. There are some great calks available for RV roofs and windows, and I’d suggest having a tube on hand for when you find a leak in the future. You can save propane by not running your water heater all the time, and turning the furnace off at night and snuggling or putting an extra blanket on the bed. You can run a battery down overnight with a lot of heat usage. RV batteries…you have at the very least 2 batteries in your Rig and maybe more. You have battery for starting the engine, and you have coach battery or batteries for lights inside, and if you have enough batteries and an inverter, you can watch TV, run the micro wave and pretty much live in the dirt like folks in town. If you have room, 2 6 volt golf cart batteries (deep cycle) will last longer than a single 12 volt battery. We are set up with 8 6 volt batteries. 2 are for engine starting, and the other 6 are our power source. We seldom use our generator as we have 4 big solar panels on the roof to charge the batteries. We also have a 2500 watt power inverter to convert 12 volts to 110. We can watch TV all night without a problem as well as operate the computer and satellite internet equipment. Carry a step ladder so you have a way to clean windows, wash the rig perhaps, and make repairs if necessary. It also is a must if you are strapping your awnings down. Consider joining an RV camping club. These clubs are available for just about every interest, vehicle type, and lifestyle. RV clubs are a great way to meet new RVers with similar interests, and these clubs have camping trips that will show you new places to go RV camping. You can find a list of every RV club we know of in our RV Clubs Section. Though we included this item in our checklists section, it bears repeating here… Always have extra fuses for those unexpected RV electrical malfunctions. Additionally, keep in mind not all fuses are of the same type, so be sure to have the type and rating of fuses your RV uses. Finding information about RVs and RVing can be frustrating. A web site with links to many RV related web sites is rvresources.com. The site is set up in categories to help you find what you are looking for quickly.